This is a post about pigs. Take two. None of us slubs thought that our first post about pigs would generate much excitement. We thought it impossible that everyone could love pigs as much as we do. 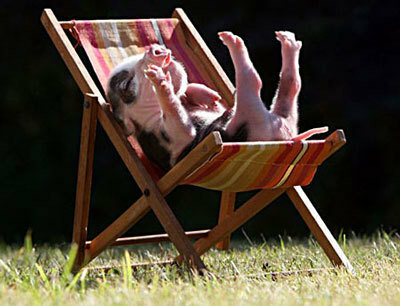 But you, dear readers, do love pigs! You love them a lot. In fact, you love them so much that pig search terms are the number one search engine terms to refer people to our blog. Some of these terms include (sorry for the grammatical mistakes, I did not write these): miniature pig(s), baby pig, mini pig, pigs as pet, miniature pigs pictures, pet pig that stay small forever, tiny baby piglet, miniature hog, and my two favorite: fuzzy baby sleepy pig and real small furry pink pigs. So, because you, our readers, asked for it (okay, you didn’t specifically solicit us to write another post about pigs, but we are going to assume that you won’t mind) here is a post about my two favorite pigs. 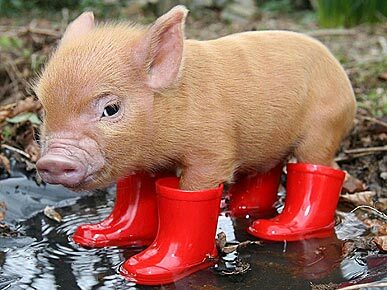 But before we start, here is an adorable pig in rain boots. Ah. 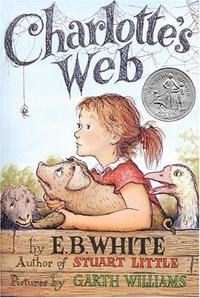 The classic children’s book by E.B.White about a pig and a spider. I suppose Charlotte, the spider, is the true hero of the story, saving Wilbur from being slaughtered and whatnot by her insane ability to weave words in her web. But no one likes spiders. Wilbur, on the other hand, is an adorable pig, who overcomes adversity and America’s love of ham to triumph and, um, well, not be slaughtered. He also makes friends with spiders. Look at that: promoting literacy, eliminating racism, saving pigs. Now, that’s some book. But why, are we slubs, so fascinated by pigs? Why are we so in love with the adorable creatures? Now, I could try to connect these wonderful pigs above back to the slubs’ greater world ethic: we like literacy, teamwork, and overcoming adversity. We value friendship and sacrifice, etc. But, no. Sorry for the disappointment, but this is not why we like pigs. 1. They come in miniature form. Perfect for our duplex. Perfect for our love of miniature things: mini cupcakes, mini shepherd’s pies (ask Laura), other mini pies… Okay. We like mini food. 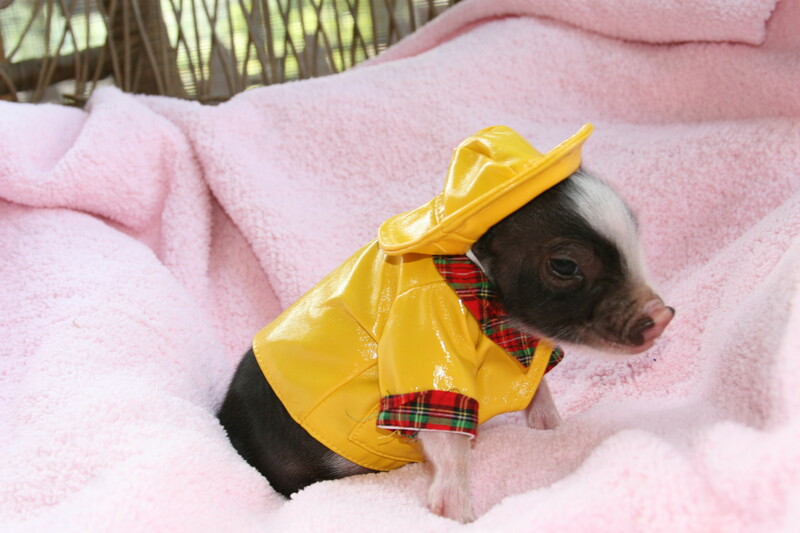 We would not make our mini pig into mini bacon though. Why? Everyone wants more bacon, not mini bacon. 2. Pigs are clean animals. Between our love of stretchy pants (read: love of slubbin’ around) and our busy lives, the slubs barely have time to clean up after ourselves. Yes, being an adult is hard. But pigs can be house trained and, according to wikipedia, keep themselves “exceptionally clean.” We would become cleanliness winners. Maybe we could teach the pig to clean the bathroom. 3. Pigs are smart. Apparently you can train them to do fantastic tricks. 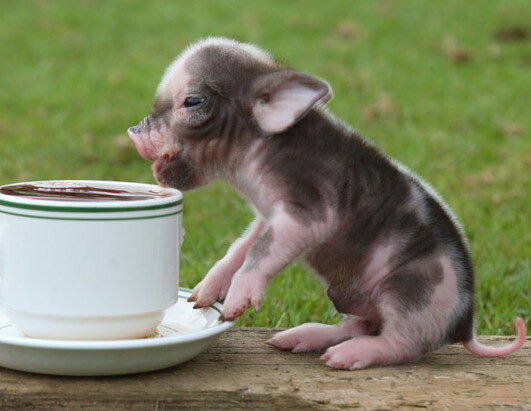 Further research on the all-authoritative internet told me that we can train our teacup pig to do the following: sit, bow, play the piano, play golf and soccer, slam dunk a basketball, jump through hoops, push a toddler’s pram (finally. someone to walk the baby), shake hands, and wave hello. Slubs could have our pig entertain guests, do laundry, put on puppet shows, play competitive sports, etc. What more do you need in a pet: small, clean, smart. We could even buy our pig a pair of stretchy pants so it could join the slubs on the couch to watch 30 Rock. Pigs are the slubbiest of all creatures, whether they are our fictional friends or our real pets, and we love them dearly. Categories: adventures in musing | Tags: learning, love, pet, pigs | Permalink. Very cool. Great pix. Thanks. Keep Blogging, Keep Writing. 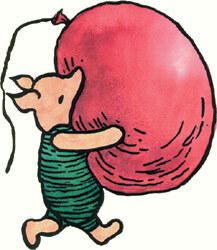 I’m reading Charlotte’s Web to my kids at the end of every day. They need some chapter book in their lives.